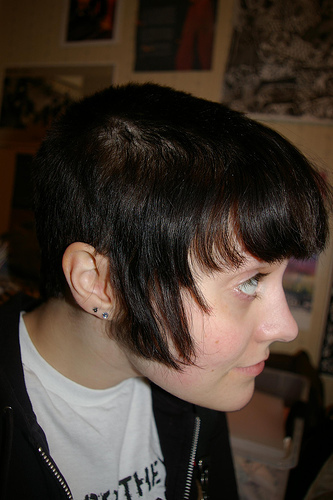 I guess my teenage years just imprinted this on me but I love the tomboyish look of short hair on girls (shaved underneath) and, basically, skinhead or oi culture attire. Unfortunately, I am older and the whole doc martens and flight jacket thing would look ridiculous on me. Anyone else appreciate this style, or even remember it? Now made in South Korea. Ah, 90's nostalgia, what ever happened to you? hmm... somehow I missed all that, and I'm glad I did. Where was in the 90s (high school and college, 1991-1999), the more butch trend for girls wasn't as big as it was elsewhere in the country. There were numerous fashion trends in the 1990s, and the ones most common for women where I was at the time, were less like the above and more girly... crushed velvet scoopnecked bodysuits under belted jeans, chunky maryjanes, chokers, long, straight hair. Basically like Shannen Doherty/Jennie Garth on Beverly Hills, 90210. Much more common where I was, which was less "counter culture" than urban-suburban areas and other regions. Docs were around, but not ubiquitous. It was a more rural, conservative area, and most people's fashion cues came from TV. To get the look like the above in any real numbers, you had to go somewhere much more urban than where I was. At my college, "The Rachel" hairstyle was more widely seen by the late 1990s than any of the partially shaved 'dos. I still have some Docs and I'm 47. Wear whatever you want, OP. Skinny Puppy and Ministry come to my mind when I see that attire. 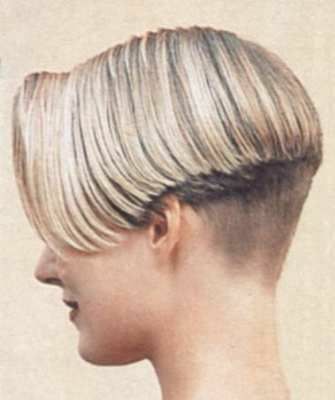 I had a haircut very similar to the first one in the early '90s but not quite as extreme. No Doc Martins or flight jacket, though. Last edited by randomparent; 01-10-2015 at 05:59 PM.. I had the same cut back then as the first picture, just a little longer on top, always shaved. Some of my friends had the cut shown below. We were a product of the post punk era, punk, skinheads, goths, and art students. Back then we were definitely living on the fringe of society. Shaved heads, piercings and dyed hair was far from socially acceptable compared to today. Throw in a little grunge on the side and a few black leather bike jackets - the bombers and 2nd pic were mostly seen on the skinheads, along with super-skinny jeans rolled up at the ankles. Bought my first pair of combat boots in P-Town, Mass in the late 80s. Manic Panic was hard to find without a trip all over town to that hidden alt store. I know, right? I remember piercing my own nose and dying my own hair when I was younger. Saw a whole football team the other day, with mohawks. We were trendsetters in some ways.